Nestled in the quaint little town of Luling, TX, at the entry to the Texas Hill Country and home of the world famous BBQ joint “Luling City Market BBQ” you will find HollyDee Quilts. 45 minutes south of Austin, 45 minutes east of San Antonio and just 5 minutes from I-10 you will step back in time when you enter this shop. Their home is a restored, rustic building right on the “main drag”. Upon entering you will find numerous Judy Niemeyer quilts hanging from the high ceilings. You will definitely want to visit frequently for inspiration and guidance for all your sewing and quilting projects. Owner, Denise Green, became a Certified Instructor for Judy Niemeyer quilts in 2011 and spent the next 6 years traveling the roads of TX as well as UT, NV and CO sharing her passion for Judy Niemeyer Quilts. In 2016 she opened her shop in Luling and you will find students from all over TX as well as other states enjoying the benefits of her extensive training Judy Niemeyer and Quiltworx. She and her staff love helping customers custom kit all of their quilt creations, especially Judy Niemeyer Quilts. When available they use Quiltster to help quilters choose the perfect fabric palette. All fabrics are labeled to allow for a quick start to your project. When the quilter is not inclined to cut their own project, the happy staff at HollyDee Quilts will prepare a pre-cut, ready-to-sew kit for you. Peggy J Hansen Great work!!! Mitzi Grant Busby Pretty cool quilt! My To Baby Sisters, Quiltworx.com, Made by CI Denise Green. Geese at My Wedding, Quiltworx.com, Made by CI Denise Green. Split Log Cabin, Quiltworx.com, Made by CI Denise Green. Compass Rose Table Runner, Quiltworx.com, Made by CI Denise Green. Tink Bruning Linhart I'm seeing it in reds (no pink), blues, and whites/creams for a Quilt of Honor! Since it's flying geese, perhaps for someone in the Air Force? Denise Green Tina Niemer you can find this pattern at quiltworx.com. It is called "Hoffman Crackers" or ask your local quilt shop to order it for you! Jonilea Hull Hahn Man I commend you. For all the time and the colors are great. Tina Niemer How do I find this pattern? Jackie Kunkel You did a fantastic job, Denise!! Can't wait to start on this one too. Linda Shumway my first thought was drunken sailor! Judy Beebe What fun! I'd substitute a couple of yellows for the pink and burgundy/purple to make it fit my color schemes. Coxcomb, Quiltworx.com, Made by CI Denise Green. Lisa Peckham Hoyt Holy crow... that's amazing! Judy Wilson Smith This quilt just makes you happy. Cecelia McKinney WOW! Like isn't enough for this should have LOVE to click on! Kay Murphy Denise is so talented! I love taking classes from her! She may have to teach that one after the Mariner's Compass retreat! Hint, Hint. . .
Leslie Dawson Mary - can you teach me how to do that? Over the phone..haha! Luana Sanders Enloe Great variation! Jackie Kunkel Denise Green you and I are kindred spirits with the brights! Love this!! Lis Martion Wow! This is pretty kool..
Phyllis Hobson Smith This is so pretty. Do you do quilting, Hope? Tonya Kuykendall Reichard Love this quilt!!!!! Mariners Compass, Quiltworx.com, Made by Certified Instructor Denise Green and Certified Shop Pinwheel's and Posies. Jess Milne That's amazing... Is there a pattern for this? Barbara Gutierrez Love the 3D look! Marielle Cano oh my gosh I don't think I will ever have the experience necessary to tackle this one. Holly Pietz Denise can I take the class on this?? Denise Green Holly Pietz come to our "Quilt til you Wilt" event March 15 - 17. You would want to come over the evening of the 14th. It would be fun fun fun! Lindsay Galli Explosion of color right there! Judy Dodge Meives Eclectic. Tis a good color combo for Christmas Season. Love the Pine Green, rather than a plain green. Fran Tracey I don't know if I like this or not. It's very striking though. Beatrice Skenandore real artistic i love it! Lou Shafer Way to go, Denise!! Grace Marie Patane Stunning! Very dramatic! Ida Higgins That is beautiful! Linda Gentry Guest I love this-would like to make it. 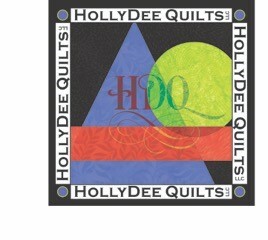 Sorry, there are no classes scheduled for HollyDee Quilts at this time.